You get your hot order delivered to your desired location in the Houston area the way you want them fresh and hot guaranteed. 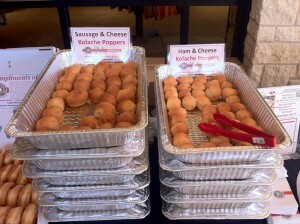 You can chose from Sausage & Cheese, Ham & Cheese, Jalapeno Sausage and Cheese, Big Earl Jalapeno Sausage & Cheese in addition to their delicious hot and fresh beignets-spicy Italian Sausage with Provolone Cheese. All these specialties are delivered to you when and where you need them hot and fresh-guaranteed. Choose from Shipley’s mixed variety options such as White Sprinkle, Strawberry Sprinkle (pink), Cherry Sprinkle (red), and Chocolate Sprinkle. You will not taste better fresh and hot baked donuts anywhere in the Metropolitan areas of Houston than at Shipley. Come to Shipley or Shipley will come to you. We offer Hot Donuts 24 Hours a day-Guaranteed, Drive Through Window open 24 hours a Day, Full Espresso Bar, Frappes & Smoothies, Online Ordering, Catering services and Delivery. At Shipley we take pride in serving you. We designed our service around our customers’ sophisticated taste. We have a full line of Mixed Variety of Filled Donuts our customers love, including, Lemon Filled, Chocolate Filled, Cherry Filled, Strawberry Filled, Apple Filled, Blueberry Filled, Raspberry Filled, Bavarian (custard) Filled, White Cream Filled, Chocolate Cream Filled, Devils Food, and Boston Cream. Shipley’s Cake Donuts Mixed Variety will satisfy even the most sophisticated taste around. We offer, Plain Cake, Cake Glazed, Buttermilk Cake, Buttermilk Cake Glazed, and Chocolate Iced Cake. The rest of our Cake variety offers include, Chocolate Iced Nut Cake, Plain Sugar Cake, Cinnamon Sugar Cake, Coconut Iced Cake, White Iced Cake, Blueberry Cake, Blueberry Cake Glazed, and Chocolate Cake. We guarantee freshness and hot Donuts with 24 hour drive through window service. Why not let our experienced staff prepare freshly baked donuts for your next event? We have customer friendly and courteous staff to serve all your catering needs any time you want to stage an event. Contact Shipley today to discuss your catering and delivery needs at (713) 589-3292 for our Westheimer location or at (713) 651-3033 for our McKinney St location!.